Aloe Firebird seeds – Is it difficult to grow Aloe Firebird from seeds? How to grow Aloe Firebird from seeds? 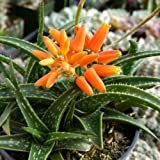 Aloe Firebird seed easy to grow from seeds but easier start cutting or plant, grow Aloe Firebird from seeds: make hole 2-3 mm put the seeds and cover lightly, better to do it in the spring, well-drained soil, little moist not too much don’t let it dry and don’t over water.